The Cree Nation Government plays a vital role in the protection, promotion and expression of Cree culture and language, two aspects of our identity closely linked to the health and dynamism of our communities. We support a wide range of programs and services to revitalize and empower the people of Eeyou Istchee. We also work proactively with local and regional Cree organizations. Our mandate is to support social and cultural development in Eeyou Istchee. We design programs that address the pressing needs of Cree youth, Elders and women. We also enable sports and recreation programs which are vectors for change in our communities. To research and honour Cree history and traditions, we’ve implemented programs related to such topics as archaeology and toponymy. We’re also invested in establishing a Cree language commission. Because we know that our culture and language must be integrated into all spheres of life, we advise on the Hunting, Fishing and Trapping Coordinating Committee, as well as on the Cree Hunters and Trappers Income Security Board. The department negotiates and manages agreements from several provincial ministries and makes funds available to Cree organizations. We also handle funding agreements with the Ministère de la Culture et des Communications and actively support the Aanischaaukamikw Cree Cultural Institute (ACCI). Because our mandate is wide, the Social and Cultural Development Department has responsibilities in various sectors. The Cree Nation Youth Council has made partnerships with the Cree Nation Government, the Cree Health Board, the Eenou Eeyou Police Force, the Public Health Department of Mistissini and other major entities to host such as prestigious undertaking. This event is to be one of the most major endeavors to change the future of the Cree Nation. To make this event a high impact event it is imperative to have partnerships with various groups. The publicity so far has attracted many Cree media interests such as the Canadian Broadcasting Corporation and the Nation magazine. Several interested parties have contacted the main organizer to become involved. 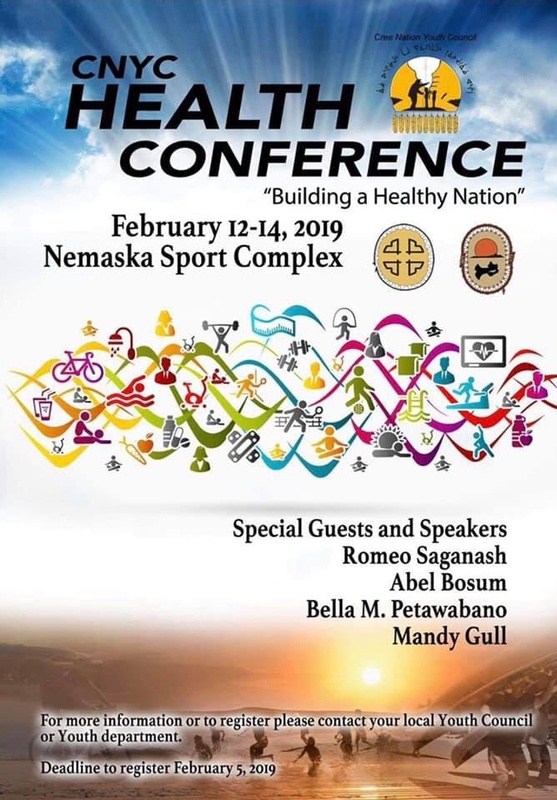 This conference is expected to be one of the most influential projects of the Cree Nation Youth Council and the entire Cree Nation for the year of 2019. The main goal is to address the social impacts and health issues that affect the youth of the Cree Nation will change the future of what we are as a people. With the support of the leadership of the Cree Nation it is expected to have a pivotal effect on how we live and foresee the Cree Nation of the future. Please contact administrative assistant, Charlene Matoush, at Mistissini office.